The best way to prevent your ecommerce business from losing customers due to the lack of well-timed reliable support is to add a helpdesk service to the set of features already available on your website. We’ve already gathered the best helpdesk platforms in this post: Top Helpdesk Services and Tools, and below you will find a detailed description of Mirasvit Help Desk MX – one of the first helpdesk Magento 2 extensions. With the help of this module (note that it is available for both Magento 2 and 1), you can provide your clients with outstanding support. 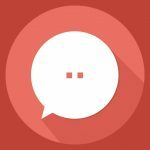 The extension gathers all inquiries, emails, and offline chat messages together, so you can easily collect and process them within a user-friendly interface. Furthermore, Mirasvit Help Desk MX for Magento 2 and 1 will prevent all inquiries from being lost assigning each message to the right department. evaluate your team achievements on the basis of advanced reports. As a result, you not only help your customers with their issues but also dramatically increase the quality of user experience. Below, we will show how Mirasvit Help Desk MX for Magento 2 and 1 looks from the perspective of admins and buyers. On the Tickets screen, you have a grid with all available tickets. You can apply filters to find specific tickets. Besides, it is possible to sort them according to the information available in each column (ascending/descending or alphabetical order depending on the content). The grid is highly customizable, so you can choose what columns should be displayed. Now, let’s tap on a ticket to see how each ticket page looks. On the top of the screen, you can see the ticket ID combined with its subject. Below, there are 4 tabs: General, Additional, Follow Up, and Other Tickets. Next, the screen is divided into two columns: with general information on the left and messages on the right. 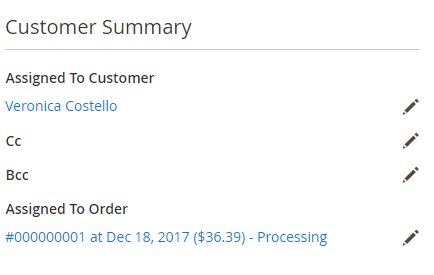 You can see a field with an email address of a customer in the first column, and, next to it, a text field where you can leave your messages. You can send a message right to a customer (as a public reply), leave an internal note (customer will not see it), send a message to a third party (customer can see it in the ticket history), or leave an internal message to a third party (customer will not see it). 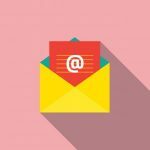 In case of Public Reply and Internal Note, you don’t need to enter any additional emails, but they are required if you send messages to third parties. Besides, you can attach files to your messages. Below the text field, there is a ticket history. As for the column with general information, it contains a customer summary with the information about a customer and an order to which the ticket is assigned. There is also the Ticket Summary section with its current status, priority, and ticket assignee name, as well as the field with additional information. 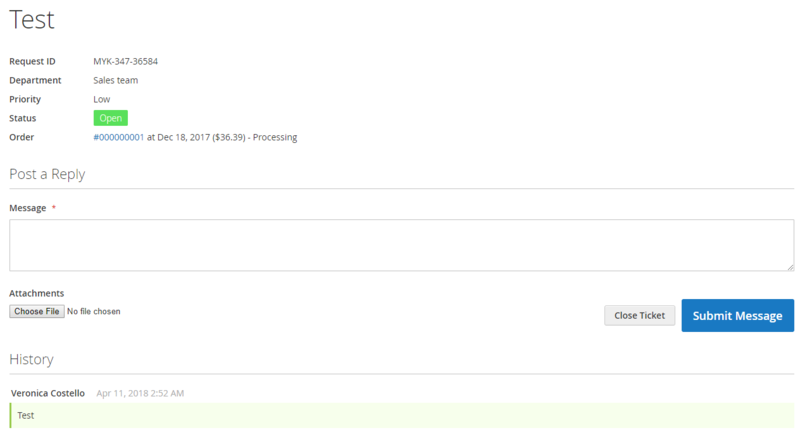 As for the Additional Information tab, it consists of such fields as Subject (of the ticket), Store View, Channel (from where ticket comes from), External Link (you can send it to third parties), and Tags (it should be a comma-separated list). Besides, there is a table that contains Ticket History. It shows the subject of the ticket, its request ID, related department, priority, status, and order. It is also possible to post a reply here attaching files to it or close the ticket. Below, you can see the history of messages related to the ticket. Now, let’s return to the Follow Up tab of the Ticket screen. You can set the period of follow-ups and date of their execution, activate reminders and specify email addresses for sending them, as well as change status, priority, and owner on this tab. The Other Tickets tab contains all tickets related to the same customer. You can create new tickets on the basis of the described example, just hit the Create New Ticket button on the Tickets screen. This is a handy feature that adds a lot of automatization to your daily helpdesk routine. Gateways provide the ability to connect your support team email boxes to Help Desk, as well as convert email inquiries into tickets. If you have several departments with their own email boxes for inbound inquiries, you can synchronize them with the Mirasvit Help Desk MX module, so it will automatically redirect all requests converting them into tickets for the appropriate department. Furthermore, you and your admins can also reply via email, and the extension will add these replies to related tickets. On the Statuses grid, you can add new statuses, modify the existing ones, as well as apply filtering and sorting options. The grid consists of 7 columns: checkboxes, ID, Title, Sort Order, Color, Store View, and Action (Edit). For each new status, you have to specify such information as title, code, sort order, color (there are lots of colors available; label example is available below), and store view. 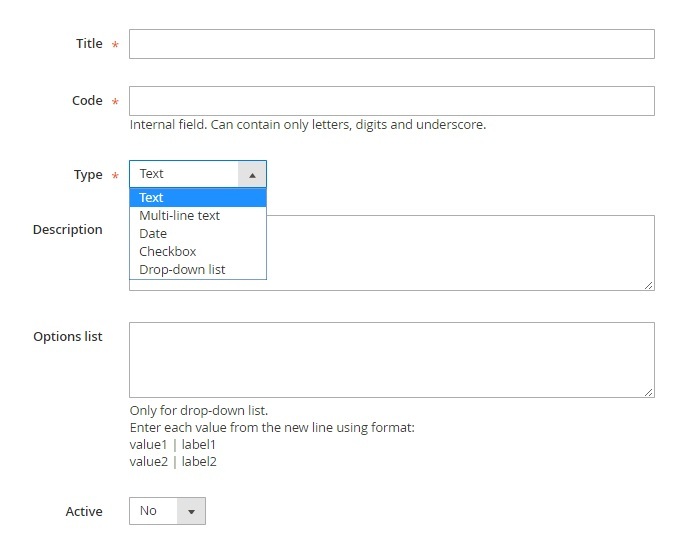 Custom Fields is another screen available in Mirasvit Help Desk MX for Magento 2 and 1. 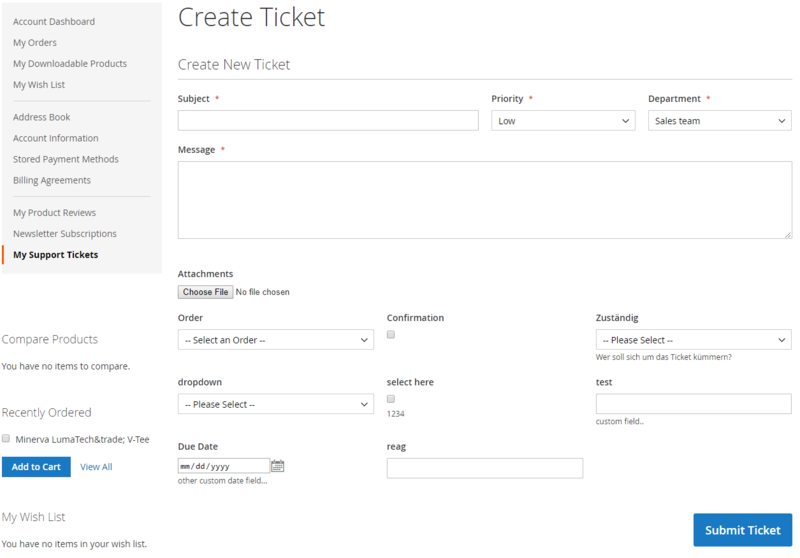 It lets you add any custom field to your ticket form. The feature is beneficial if you want to get more information about a customer issue. You only have to ask him or her to specify details in the additional fields. 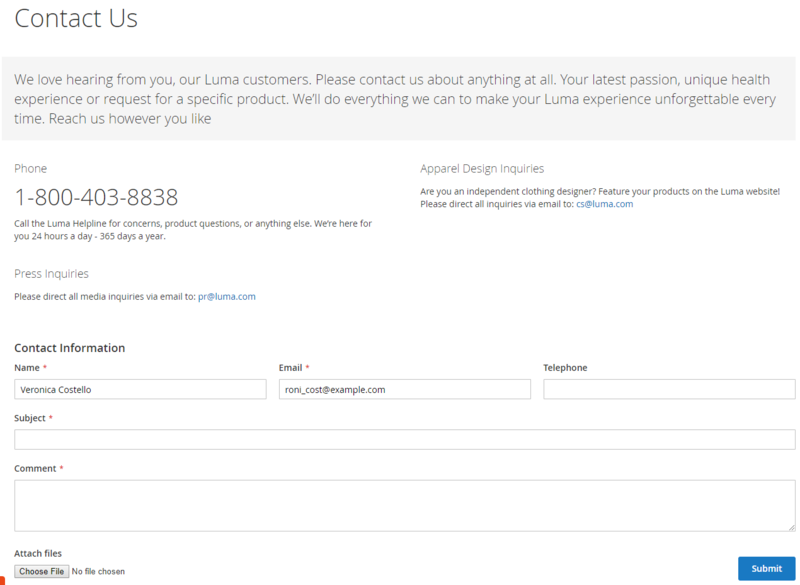 Custom fields are available at the native contact form, contact tab, ticket creating interface, as well as popup contact form. 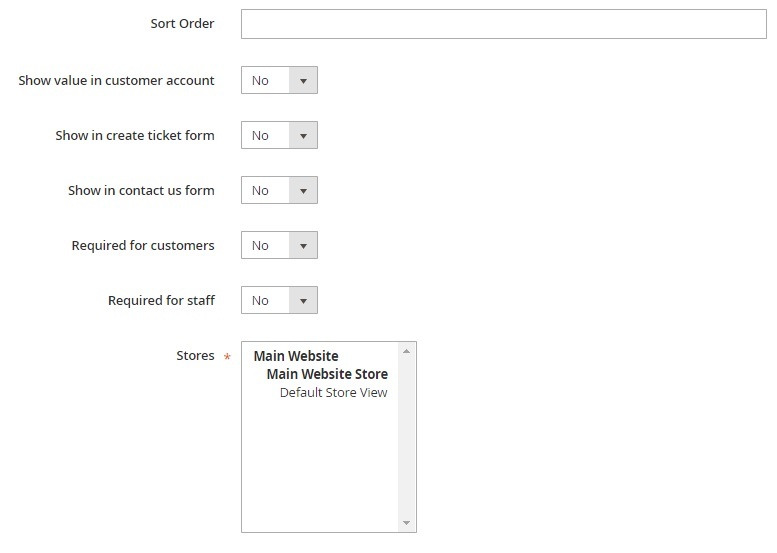 Besides, you can specify a sort order, choose where to display the custom field (customer account, ticket form, contact us form), decide whether it is required for customers and staff, and set a store view. Mirasvit Help Desk MX for Magento 2 and 1 lets you manage your support team permissions within a convenient interface. Separate the roles for your support divisions so that each division will handle tickets related to their duties only. To add a new permission, it is only necessary to specify its role (Scope), decide to tickets of which departments access will be given, and activate/deactivate the permission. Here, you can arrange post service satisfaction surveys, inserting them into email notifications footer. A tiny poll provides your customers with the ability to rate the quality of your support team members. Consequently, you can easily evaluate each employee performance with Mirasvit Help Desk MX for Magento 2 and 1. 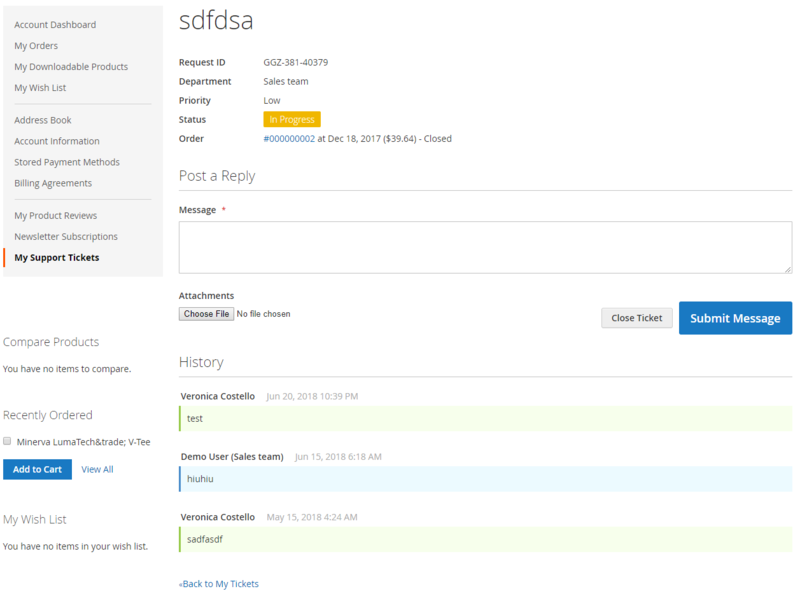 On the Departments screen, you can see all teams that can respond to tickets. 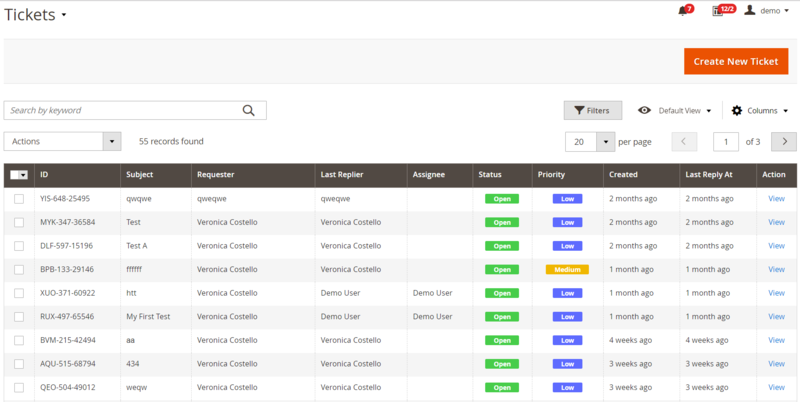 The Departments grid consists of 6 columns: checkboxes, ID, Title, Sort Order, Is Active, Store View, and Action (Edit). Each department screen is divided into two sections: General Information and Notification. 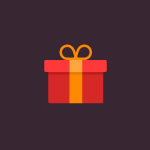 In General information, you specify a title, status, availability on the frontend, sort order, sender email address, responsible department members, and store view. In Notification, you specify whether to send notifications to all department members if a ticket is unassigned or not. Besides, you can leave an email for sending unassigned tickets. Note that the number of support departments is unlimited. A grid with priorities is similar to the grid with statuses. Each new priority level requires the following information to be specified: Title, Sort Order, Color, and Store View. To add a new quick reply template, specify its internal title and status (Active), create a template (note that you can use variables), and choose a store view. To create a new filter, you should specify its name and status, choose where to apply the filter (Scope: Headers, Subject, Body), and create a pattern. For each new rule, there are 4 tabs of settings: General Information, Conditions, Actions, and Notifications. On the General Information tab, you specify a rule name, status, priority, and whether further rules processing should be stopped. As for Conditions, you choose the event and specify conditions. In Actions, you can select which status, priority, department, and the owner should be set; decide whether to move to or from the archive; as well as specify tags to be added or removed. 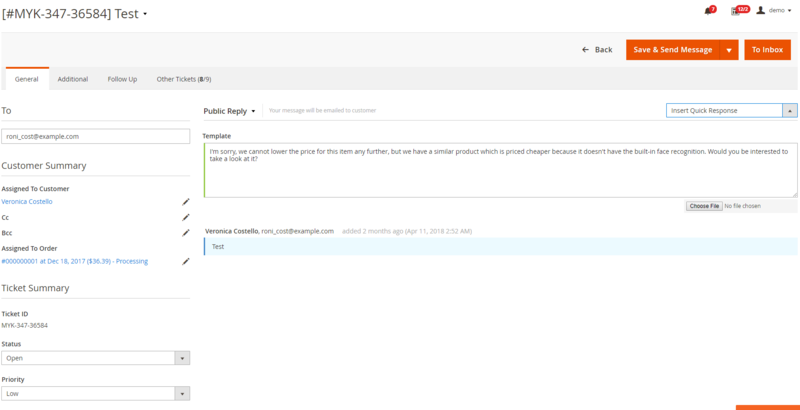 On the Notifications tab, you decide whether to send email to ticket owner, all department users, and customer or not. Besides, the extension lets you add additional email addresses to send notifications. Also, you should enter email subject and body text here. The last option enables you to attach files which were sent in the previous message to a new notification. To create a new schedule, choose its title, status, periods of activity (leave Active From and Active To empty for standard workflow), and store view. Then, specify a sort order, relation to holidays, timezone, and working days/hours. It is also possible to use variables to create open and closed messages. Mirasvit Help Desk MX settings are divided into 9 sections: General Settings, Feedback Tab, Email Notification Settings, Customer Satisfaction Survey, Customer Account, Reports, Working Hours, Developer Settings, and Notification Settings. Thus, you can apply the most precise customizations to the extension. There is a list of all tickets with the information about a department to which each ticket is assigned, last activity and status. 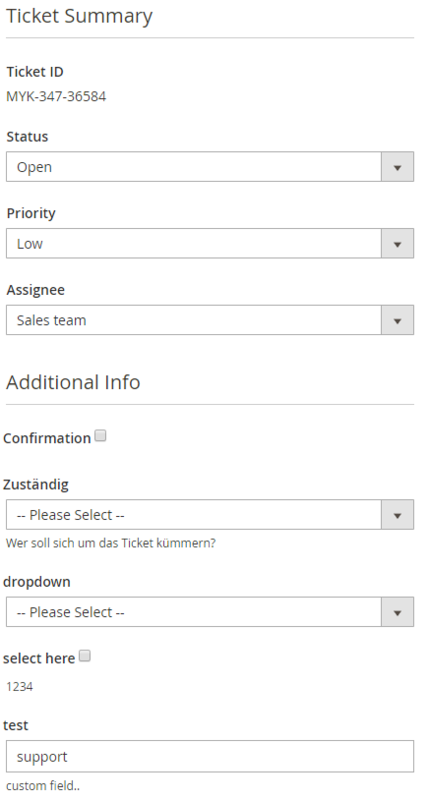 To create a new ticket, your customers have to specify its subject, set priority, select a department, and leave a message. Besides, it is possible to attach files, select orders, and specify other additional information. On each ticket screen, there are such elements like short information related to the ticket, a text field for messages (with the ability to attach files), and history. As you can see, Mirasvit Help Desk MX for Magento 2 and 1 offers an intuitive interface, so your customers can rapidly get the support they need. They can even set Priority and Department for each new ticket, but you should activate both options in settings. Besides, the ability to attach files significantly improves the way buyers communicate with your admins. Besides, Using Help Desk MX provides customers with simple ticket management, so they can quickly reply or close a ticket. Moreover, a complete ticket history is always available on the same screen. Mirasvit Help Desk MX can be connected to the company’s RMA extension, allowing you to convert tickets into the RMA requests. To do this, a support manager will only have to click the Convert to RMA button. 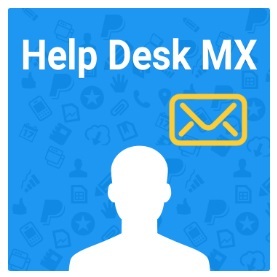 Besides, you can connect Help Desk MX to Mirasvit Knowledge Base. As a result, your customers will be able to search for answers right in the feedback popup window even before creating a ticket. 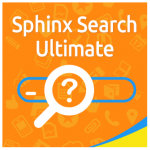 Another integration is related to Mulwi Search that enables users to search internal data through all sources in one place. Help Desk reports ( which contribute to the evaluation of support team results).